Converting a Notepad file to Portable Document Format (PDF) can be easily accomplished without using any kind of paid or free TXT to PDF converting software. No, I am not going to mention any kind of PDF converting software neither we are going to use any free notepad to pdf online website. In this tutorial, I will demonstrate a cool trick to a convert .TXT file into PDF file for free. First of all, download and install google chrome(Web browser) on your computer, you can download the latest version of google chrome by visiting chrome official site If you already have chrome installed then proceed to our steps by step guide. It does not matter at all what version of chrome you have, we just need chrome to convert a txt file to pdf file. Make sure to backup your notepad file by copying it to some safe place.we also recommend you to learn this cool trick on new notepad file instead of working directly on the main file.Let's get started with our step by step guide. Right click anywhere on blank screen, go to new, click on text document, a New Text Document.txt file will be created. 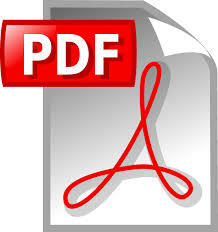 Now double click on file to open and start writing content as you want to see in PDF file. Click on the drop down arrow of label "Save as type" and choose All file (*.*). Step 3: Open the file created with Google chrome. Go to desktop, click on the file yourfilenamehere.txt and choose open with Chrome.If chrome is not mentioned in "open with" then click on "choose default program", browse chrome.exe and select ok. Step 4: Click on print. Once the file loaded in google chrome browser then press CTRL+P to open print screen of chrome. Step 5: Save .TXT file as PDF file. Now, look for the label "Destination" and click on "Change" button (in front of Destination label). Under local destination, choose "Save as PDF" and then click on Save.You can also make a professional looking PDF by controlling layout, paper size, margin, and options etc. So, this how you can create pdf file from the txt file without using any third party software or online website.If you like this cool trick then please take a minute to share this post with the people you like and on social networking sites. Watch How to Convert a Notepad TXT to PDF file without conversion software.